Toyota recommends replacing your FJ Cruiser spark plugs periodically to make sure the vehicle is running at optimal performance. Have you changed yours lately? Here’s how. Having an FJ Cruiser performing at an optimal level is important to every owner. Make sure you change your spark plugs as recommended. When beginning this maintenance work, it is important to make sure you have a proper place, time and light to do the job properly. Rushing a job, like replacing spark plugs, can cause serious long-term issues for your FJ and could cost you hundreds/thousands of dollars to repair the mishap. Having the proper tools is important as well including knowing how to replace them and what gap they should be set at. Toyota recommends you change your spark plugs every 30,000 miles. Also, make sure you have purchased the right spark plugs before hand and you either have or have considered using anti-seize spray and silicon grease. First, you will need to access the spark plugs. Depending on your model, this is accomplished by removing the V-Bank cover, air cleaner assembly and surge tank stay and oil stay plate. After removing these pieces, you will find individual ignition coils attached to each spark plug. You will need to disconnect the electrical connector for the ignition coil and unbolt it from the engine assembly. 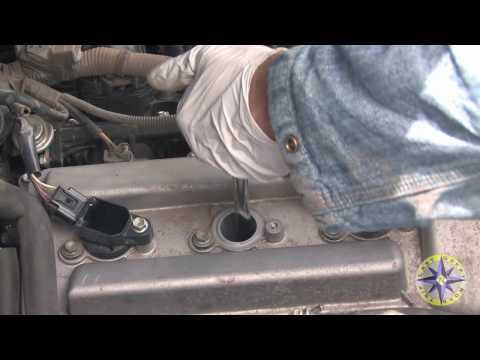 Once the ignition coil is removed, inspect it to see if it needs to be replaced as well. Next, you should now see the spark plug. Remove it using your spark plug socket. Grab the replacement spark plug and carefully reinsert it by hand. The danger is that you will cross thread your spark plug. Take extra time when putting the new spark plug back in. Cross-thread spark plug can be a very costly repair. You will need to torque the spark plugs to the proper ft/lbs as recommended by Toyota. Check your owner’s manual. Next, you will replace the ignition coil back over the spark plugs. You can use the silicon grease at this stage to ensure a tight dust seal. After replacing all 6 spark plugs, you will replace the parts taken off above in reverse order. Properly maintaining your FJ Cruiser is vital to its long-term dependability. Congrats on replacing the spark plugs and keeping the engine firing at its most optimal level.